Benito Mussolini was named for Benito Juarez of Mexico, because his socialist father felt it would give his son character. Strong willed, and intelligent, when his father was told by the nuns that his son had academic promise, Signore Mussolini told his son to beat his teacher up, lest she encourage the boy to be an academic and not a laborer like himself. Benito did. It did not really work as Benito became a school teacher himself where he bullied students and enforced discipline. Parents were ecstatic at his results and from there he rose within the party as someone who got results. Still outrageous stories follow Mussolini and its hard to know which are true. He admitted to knifing a girlfriend in the arm to test her loyalty and pinched people at church to see if they would interrupt the service, and a led gangs of boys on raids of local farmsteads for fun and profit. Federico Fellini portrayed this well in his classic movie, La Strada where Anthony Quinn big and mighty is Il Duce and little playful Giulietta Messina, Italia. It is a brutal movie. Mussolini was married twice, Jupiter in the seventh often shows in the charts of people with multiple liasons and for him it is also conjunct Venus suggesting that at least one will be via philandering. 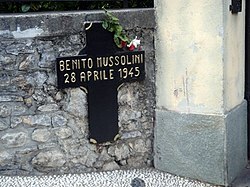 For Benito that was actually two, because one can only be married for a first time once and for Il Duce that was to Ida Dalser with whom he had a son, Benito jr. During that marriage, he began his affair with his Rachele, for whom he divorced Dalser and married in a civil service. But when a twenty year old girl flaunted herself at his feet during a parade, literally, he had another affair, this time with the adoring fan half his age called Claretta Petracci. Original caption: Benito Mussolini (1883-1945), Prime Minister. Undated photograph. Marc Jones felt that it was Mussolini’s Bundle temperament type, made him too insular a figure and intolerant of criticism. He wrote that the absence of “any oppositions” or natural disposition of the Bundle forced Benito instead to rely upon himself and ignored any chances to anchor himself in true relationships with others. The chart above shows how the core square of Mussolini’s chart is very tight and creates a well defined Yod from his Ascendant at Sagittarius 09 to the Sun at 07 Leo and Saturn at 08 Gemini: the orbs are small, almost partile. The Moon at 11 Gemini is caught between a rock (Saturn) and a hard place (Mars), not standing a chance in saying a word in that group, and perhaps it is best that she remain silent and not tell us the horrors. We will leave her alone for now. The problem, to be honest, starts with Neptune in the fifth house at 21 Taurus. While it should make the boy musically talented, and definitely prolific (he had six children) , it changed a beat and made him good with knives and swords — prodding people, gouging animals and generally being as abusive to his world as had found it. He was the same to his eldest son, Benito jr., though of the others there is no word. Diaries from his mistress, Claretta Petacci tell of violent rapture where she was beaten bloodied and bruised — and she liked it, for it showed his power (Mars on the seventh house cusp). Pluto, though not there when he was born, is not transforming the anger into something noble, but instead hit too hard by Saturn, became stunted and mean. The bit of brilliancy his school teachers saw shows up at Mars (Gemini 14 has the Hyperion symbol of “Climbers above the tree-line” with the clarion call of “challenges”) ending the parade with a wild display of bravado and genius. Donna van Toen in her 1988 book, The Mars Book: A Guide to your personal energy and enthusiasm, writes Mars in Gemini has ” high mental energy” that more idealistic than practical, while their “emotional energies range from high to low ” verging on erratic. For Mussolini, this Mars placement is pivotal in his chart as it is the midpoint of the bundle temperament. It is the dynamic focus that forces itself outside from his center, making him want to change all around him until it reflects his personality and he becomes safe and protected from within. Mars in Gemini also gives Mussolini good manual dexterity, noted with his swordsmanship, a vivid imagination and part of a strong stellium the willpower to proclaim himself “Il Duce’s” with no acknowledged support. Raised as a socialist, when they tossed Mussolini out for supporting World War I, he reformulated the socialist party into a new guise of what he called “fascism,” but better known as national socialism (i.e. Peron in Argentina, Franco in Spain, Menzes in Australia, Stalin in the USSR, Hitler in Germany, Mao Tse-Tsung in China, Fidel Castro in Cuba, Hugo Chavez in Venezuela) He insisted that his utopian revolution must level all previous social structures to free the common man from the taint of traditional religious and cultural thought. While that would not have made Mussolini’s Brown shirted fascists any different from Marx’s communists, the innovation was in the creation of some innovative philosophical constructs to support this. Marx had been plagued with his philosophy lacking a religion; Mussolini realized that was because Marx had not met him for the former realized the relgion was the “cult of personality” where the leader is glorified into the father figure-leader of the nation. To begin this crusade, first, he extolled his fellow countrymen in being part of a master race or group that had to be “nationalized” under his leadership for the greater good of one united Italy. He began a strong campaign claiming that it was individuality that was the the culprit of Italy’s country’s problems and that only a “natural” leader, like himself, could solve these crises by forbidding personal liberties and individual exceptions. To enforce these edicts, Mussolini enlisted bureaucrats, soldiers and police to watch and patrol their fellows and report all misdemeanours to the town committee for review. These edicts slowly created a reign of terror, where free speech was not literally outlawed just muted, as opponents feared for their family, jobs and ultimate safety. This elaborate ideology where he, Il Duce (the Leader) was no longer just a mortal person, but the supreme man who lived, like his followers, for the great good. In Germany, Hilter was worshiped as a god; in Italy like our header picture, many thought he was a saint. Nothing lasts forever, and for Mussolini the fall comes from the ninth house with Virgo. at was predicted with the square from Uranus in the ninth, the utopian vision, to Mars in Gemini putting great stress on the lack of an economic basis. While taxes were raised, wages were lowered as people were now paid by the intangible “community service.” His relationship with Jewess Claretta Petacci became problematic (the midpoint of the square or the semi-square from Uranus) with the rise of Hitler and Nazism and the War gave voice to that long suffering Moon who found an outlet at first house after being squeezed by Mars and Saturn for so long in the peasants who hated him and wanted him dead. A comic transposed over a scene where the two were murdered. By April 28, 1945 everything had changed and Il Duce’s chart had moved from the right hand of experience to the left side of resourcefulness while his notorious Mars met the socially disruptive force of Uranus and Il Duce and his beloved Claretta were no more. The Moon, the essential ruler of the fourth house is now in Scorpio inconjunct his Mars stellium in the eleventh suggesting that many Italians were sick of his propaganda, his police state and him. His brain child the utopian fascism, depicted by his Part of Fortune at 21 Aquarius, continues.